Waterman L. Ormsby, first through-passenger on the Overland Mail stagecoaches. The Butterfield Overland Mail Co. carried its first U.S. mail westward beginning September 16, 1858, with the company president, John W. Butterfield Sr., taking custody of two mailbags at St. Louis and boarding a Pacific Railroad train for Tipton, Missouri. 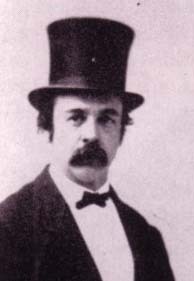 Accompanying Butterfield was Waterman L. Ormsby, a writer for the New York Herald and the only person to purchase a through-ticket for the first trip west. 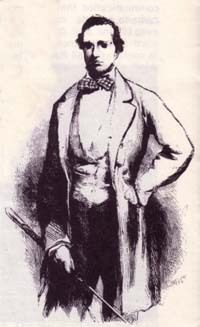 John Butterfield, a son of the founder and driver of the first west-bound stage. The coach was soon swaying through the prairies and wooded groves of central Missouri and into the darkness of night before reaching Warsaw. Ormsby couldn’t see where they were headed and wasn’t sure the driver quite knew his way either, and “the coach lamps seemed to be of little use in the dim moonlight.” Still the drivers were covering the route faster than the Butterfield Timetable had delineated, an advantage that would be needed later in the trip. “I had thought before we reached this point that the roads of Missouri and Arkansas could not be equalled; but here Arkansas fairly beats itself. The coach crossed the Arkansas River at Van Buren by use of a flatboat. The far side of the river was described as flats with little quicksands. Reaching downtown Fort Smith a little after 2 a.m., passengers of the coach from Tipton found the town excited because the coach from Memphis had arrived just 15 minutes earlier. Fort Smith at the time was a town of 2,500 inhabitants with two newspapers. The primary point of contact between the United States and the Indian nations, the fort itself was established in 1817, and military units were garrisoned there until 1871. 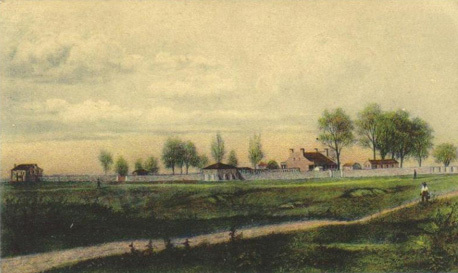 Fort Smith as it appeared in the late 1860s. The building to the left is the quartermaster’s storehouse. At center is the powder magazine and to the right of it is one of the barracks. Although they couldn’t find the immediate problem in the darkness, the stage driver discovered at the next stop that the tongue of the coach had busted. The short stop proved to be of little overall help. The average speed between Fort Belknap and El Paso turned out to be less that three miles per hour, primarily because of instances in which wild mules that were supposed to pull the coach instead got loose. “We had hardly passed through before the sound of voices and the gleaming of a light denoted that there was a party ahead of us. The awe inspiring scenery and the impressive sunset had almost set me dreaming as I lay listlessly in the wagon; but the possibility of meeting foes, perhaps a band of murderous Indians, in this wild and lonely spot filled me for a time with fears; but I had great faith in the captain’s prowess, and felt somewhat easier when he declared it to be his opinion that the party was an American one. In west Texas, the route was changed at Horsehead Crossing. Instead of going north along the Pecos River, the coaches began crossing the Pecos and following a southern route that led through Forts Stockton, Davis and Quitman before rejoining the original trail at El Paso. The southern route was believed to provide better safety and more watering holes. The one-story adobes of Mesilla, not long after the Gadsden Purchase, with the Organ Mountains on the horizon, circa 1854. The Butterfield Route skirted into southern New Mexico, passing Cornudas Peak and re-entering Texas near Hueco Tanks, or “Waco Tanks” as Ormsby wrote it. Then the route made a beeline into Franklin, now known as El Paso. The stage turned north along the Rio Grande valley, crossing the river near the town of Mesilla, a place that Ormsby described disparagingly. He had expected a much larger, bustling town. Following the established San Antonio & San Diego Mail Route, the Butterfield headed from watering hole to watering hole across the southern Arizona Territory, often using sentinel mountains as guides across the featureless land. 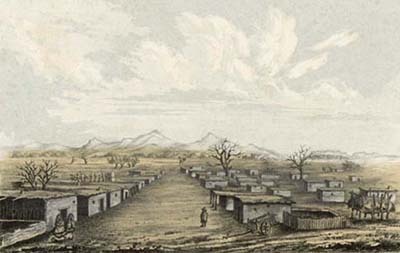 The stations at Cooke’s Spring and Soldier’s Farewell were nothing more than one tent for the station men, Ormsby wrote. The team rode more than 40 miles from Soldier’s Farewell to the next station without water. At the Dragoon Springs Station, Ormsby related the murders and serious injury of three Americans on the Butterfield road-construction crew, who were attacked while they slept by three Mexican workers of the road crew. One of the Americans died in the attack, two died during the next two days from their wounds, and the third was found four days after the attack, still alive but badly injured. 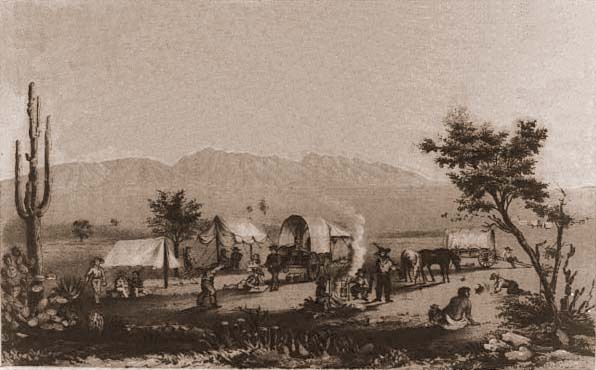 A wagon encampment at Maricopa Wells, circa 1857. The group made better time down through the Gila River valley, eventually reaching Fort Yuma. The route swung slightly south into present-day Mexico and then back north across the sands of southern California. A sandstorm from a few days earlier created tall dunes across portions of the road. The desert ended when the Butterfield coach reached the meadows of the San Felipe valley and Warner Ranch. The route then ran north through the Temecula valley along the west side of Laguna Grande, now known as Lake Elsinore.12 At the northern end of the valley, the route went north along the Chino Hills, circling around them and then west into Los Angeles via Covina and El Monte to arrive at the Bella Union Hotel on Oct. 7, 1858. With only three days to go and still behind on time since the delays in west Texas, the coach headed north through San Fernando, stopping at the mission there for a change of horses, and then continuing through the San Francisquito Canyon to Fort Tejon. After the Guadalupe Pass, the Boston Mountain of the Ozark range, the Pacheco, and the New Pass, I had about concluded that I had seen all the mountain passes worth seeing on the route and that none could be more difficult or dangerous. But I was destined to be disappointed and to witness one of the finest views which the entire route affords. 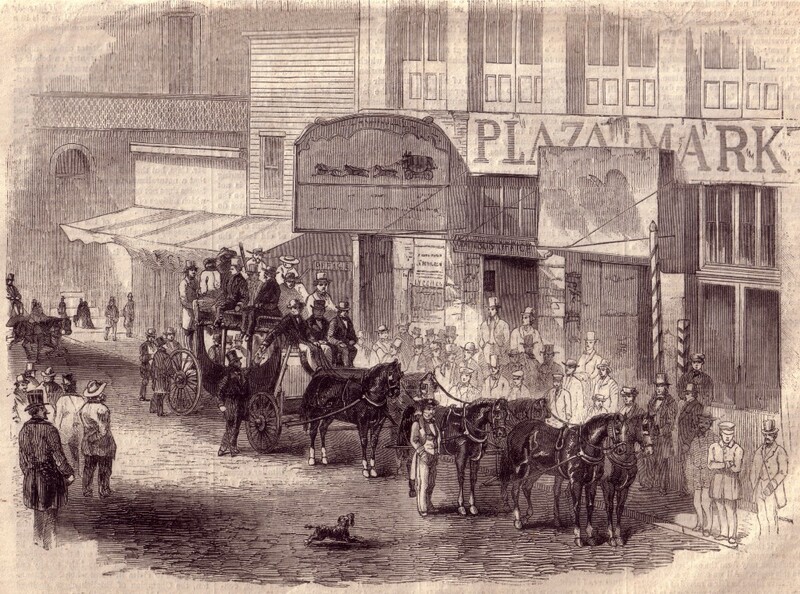 Based on a photograph, this 1858 woodcut print from Harper’s Weekly shows the first eastbound Butterfield stage about to embark from San Francisco headed to Tipton, Missouri. When first started, stages left San Francisco at 6 a.m. each Monday, Wednesday and Friday. Ormsby, Waterman Lily. Eds. Lyle H. Wright and Josephine M. Bynum. The Butterfield Overland Mail, (San Marino, California: The Huntington Library, Sixth Printing, 1968) 5. Hendricks, Nancy L. “Butterfield Overland Express.” Encyclopedia of Arkansas History and Culture. Ormsby. The Butterfield Overland Mail, 22. Mitchell, Laura. “Butterfield Stagecoaches Helped Build Local Towns,” North County Times (February 26, 2005). Ormsby. The Butterfield Overland Mail, 123.